Here’s an “animal-friendly purpose” for which $billions of your money is spent. Your ruff will go up when you learn how the government “cares about” wildlife. Susan says staff can have a lot of influence on department policy. This old military man can vouch for that. If it weren’t for staff, my division would’ve stayed in camp. Might be the same for AKC and judges, I wouldn’t know but some staffer must have thought this release was an inside joke. I found it downright unfunny. “April 1, 2011 marks the beginning of data collection for the National Survey of Fishing, Hunting, and Wildlife-Associated Recreation. It is conducted every five years by the Census Bureau (???) sponsored by the U.S. Fish and Wildlife Service” paid for with your tax dollars. Robert Groves is director of the Census Bureau. Now I don’t know the guy but I’ve got him pegged. Sounds like his publicist wrote this, "Participation in this survey is important because the results help us better manage our natural resources and to understand the demands being put on our wildlife and their habitat." Then something I didn’t know. "This is one of the many surveys conducted by the Census Bureau for other federal agencies." What other surveys does the Census Bureau take? I’ll check that out. Believing the elk were threatened, park managers protected them by killing all the predators. The elk herds multiplied so much that they ate the trees the beavers used to make their dams and houses. Anyway, this one is supposed to be about “individuals involved in fishing, hunting and other wildlife-associated recreation, such as observation, photography and feeding.” That silver-tongued staffer says we spent “$122 billion in pursuit of these activities” but fails to mention how much the Census Bureau is spending on the project. So when I tell you what I’m about to tell you, you might want to drop them a line. The Census Bureau is going to find out which park gets the most “activities.” Guess they can’t read the signs and tourist hand-outs proclaiming the Great Smokey Mountains as “the most visited National Park,” even more than Yellowstone. Ask why it is that in 1903 Yellowstone National Park was teeming with wildlife. President Roosevelt (a keen hunter and naturalist) ordered them to preserve the park in the condition he had found it. Old Teddy meant well, never occurred to him that they would ban the Indian hunters who had kept the ecological balance intact by taking elk, moose, and bison as needed. The “untouched wilderness” that President Roosevelt sought to preserve had been doing just fine for thousands of years. Then the government stepped in. The Park Service was formed to keep it “pristine” but they decimated species after species. Believing the elk were threatened, park managers protected them by killing all the predators. The elk herds multiplied so much that they ate the trees the beavers used to make their dams and houses. The beavers disappeared and “water management” problems exploded. Meadows and small streams dried up causing trout and otter to die or go elsewhere. Like beavers, they don’t drive, so you know what happened. The resulting soil erosion the beavers had industriously prevented caused widespread plant life damage. By the 1920s there were so many elk that park rangers were ordered to kill them. So they shot them by the thousands but the changes in park ecology couldn’t be undone. In an equally dumb move paid for by an unending supply of tax dollars, the federal government decided to protect the cattle ranchers who had grazing permits for what deer, elk, and bison used to eat. But those grazers were so thinned down that starving wolves took cattle, easy prey. So they were eradicated with poison bait and just as gruesome, leg-hold traps. So then rabbits took over the park, further decimating already fragile vegetation. So “wildlife management” trapped and imported wolves to control the rabbits. Understanding nothing of regeneration, the park service spent $$$ billions on fire prevention. Well hell, the government officials finally realized their mistake and decided to burn off the overgrowth. The old growth forest and dry stunted undergrowth burned like an inferno! The intense heat sterilized the ground and they had a heck of a time reseeding the forest. As an angler, I should mention that some forest service idiot decided to introduce Rainbow trout in the 70s and the trout killed off all the cutthroat species of fish. So what is the purpose of spending more money to take a census relating to use of the National Parks? Maybe we could trim a $billon from the deficit and let nature take its course. Wildlife would be better off and so would we. I am sure all of you love your dogs and have been to a State or National Park. It is part of our heritage. You probably don’t think much about the first-time mother wolf trying to find a suitable place to den up for birthing. It hardly exists. In summer Yellowstone welcomes over three million park visitors. 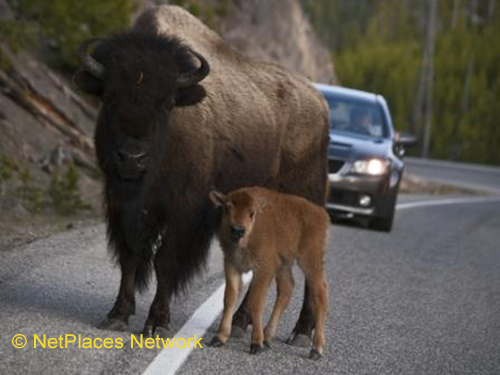 There are photos all over the net showing bison on Yellowstone’s roadways. Nothing much perturbs a buffalo but the elk all moved up to Elkton, North Dakota. The animals don’t get any peace in winter either. With the first big snowfall, more than 125,000 snowmobiles hit the backwoods. So the 2011 National Parks census job is underway but I’m sure the government can afford it. They aren’t planning to trim the budget that much. Hey Mr. Bison, move over for the tourists so they can be counted!